The good news is that Michigan is finally playing good defense. The bad news is that they still can’t shoot. Michigan beat Iowa by 14 points and the result was never in doubt but it’s tough to get too excited. Iowa didn’t record their first field goal until the 10:34 mark of the first half. Michigan controlled the game but there were probably only 10 minutes total where I’d say Michigan looked impressive. 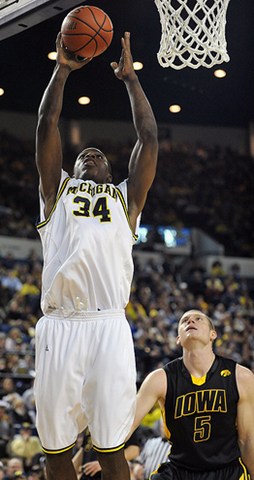 Manny Harris and DeShawn Sims scored 40 of Michigan’s 60 points but they weren’t very efficient doing it. The duo combined to take 34 of Michigan’s 58 field goal attempts and notch 8 of their 12 turnovers. It’s tough to blame Harris or Sims because they are forced to carry the load but Michigan is going to need a better effort going forward. Offensively, Michigan continues to struggle a lot. They struggled to make shots, with a shooting line of 42.2/43.7/26.9. They didn’t hold onto the ball (21.2% turnover rate) and they didn’t shoot many free throws (24.1 FTR). For a change, the one area where they dominated was the offensive glass. Michigan rebounded a whopping 51.3% of their missed shots and DeShawn Sims alone had 9 offensive boards (he did rebound several of his own misses). 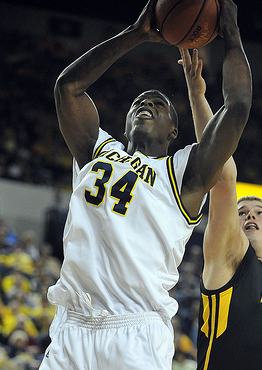 Defensively, Michigan dominated Iowa. The Hawkeyes shot 34.5/41.2/16.7 from the field, rebounded 32.4% of their misses and turned the ball over on 17.5% of their possessions. Credit Michigan’s defense but Iowa just couldn’t get anything going on the offensive end of the floor. 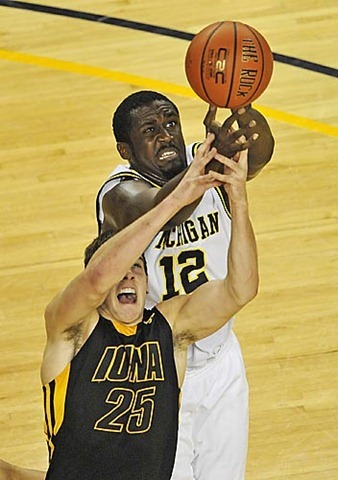 It also helped Michigan that Aaron Fuller, who presented the biggest mismatch, only played 26 minutes due to foul trouble. Michigan will take wins any way that they can get them at this point. If Michigan plays with the the same defensive effort that they have brought for the last month they are going to have a chance to win games down the stretch. If they had played the kind of defense they are playing now for the first two months of the season they’d easily have at least a couple more wins. At this point it’s clear that this team can’t shoot. It’s not some kind of extended drought or fluke – it’s reality. 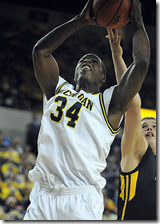 Their best chance going forward is going to be to play defense and work the offense through DeShawn Sims. Trey Zeigler made the trek to Ann Arbor for a visit and was sporting a block-M hat. According to his tweets, Zeigler also got the chance to meet Jimmy King. 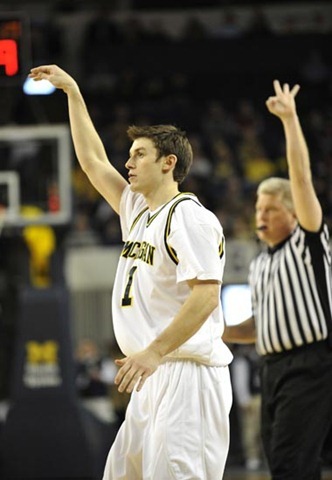 There will be plenty of shots and playing time available next year if he decides to attend Michigan. Trey put up nice numbers Friday night in Mount Pleasant’s 7th straight win over Bay City Central: 28 points, 7 rebounds, 7 assists, and 5 steals. DeShawn Sims: DeShawn Sims is a first team all Big Ten player; he added 20 points on 9 of 18 shooting and 12 rebounds tonight. Peedi has an offensive rating of 113.6 (9th) and is using 28.2% (6th) of Michigan’s possessions and is averaging 20.6 points (1st) and 8 rebounds (3rd) per in conference play while shooting an eFG% of 56.7% (7th). As someone who has criticized Sims’ motor, mentality, consistency or whatever else at times, it’s time to give him credit for playing so well in conference play. Manny Harris: Manny scored 20 points but he was definitely fighting it out there today: 20 points, 6 of 16 (3-9 3pt) shooting, 6 rebounds, 3 assists, 6 turnovers. Manny started out smoothly, getting involved when he could, making good passes, and getting some nice looks. Then the wheels fell off a bit as Harris started missing bunnies, forcing passes, and just becoming all around sloppy with the ball. 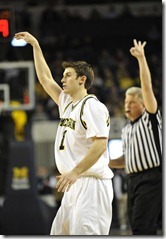 Zack Novak: Novak needs to stay out of foul trouble or Michigan will lose games that they shouldn’t. The drop off from Novak to Wright is appalling to see in action. Novak hauled down 6 rebounds and dished 3 assists to go with two 3 point makes out of five. Stu Douglass: Douglass wasn’t bad, but I would hesitate to say he played well. He hit a couple early threes but finished 2 of 8 on the day for 6 points with 4 rebounds. Make your layups man! Darius Morris: Darius Morris needs to shoot 5,000 jump shots per day this summer. If he learns to shoot it will open up his offensive game, otherwise no one has any reason to guard him tightly on the perimeter. Zack Gibson: Michigan needs Gibson to come in the game and play hard for 5 minutes. He’s done a pretty good job of it the last couple times out. He had a basket as well as a pair of offensive rebounds with no turnovers in 8 minutes. That’s all Michigan needs. Anthony Wright: The stats aren’t pretty: 18 minutes, 0 for 3, 3 rebounds, and an assist. But I think Ant was probably worse than his stats today. He was a huge liability on defense and looked tentative with the ball on offense. Michigan won’t win many games when he plays 18 minutes.